The elegant feature is made out of Satin Poly upper body and sleeveless bodice with an elegant Organza skirt. 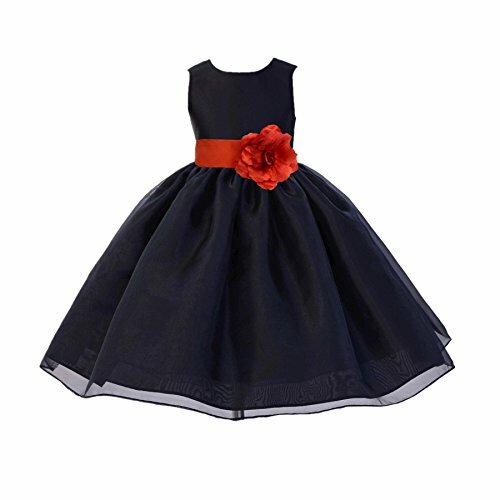 The waistline is decorated with a removable Color of your choice Satin Poly and Flower to make this dress more elegant. We used an additional petticoat that is not included with the dress. Also layered with a thin crinoline netting sewn between 2 soft lining. The back of the dress has a zipper closure and a nice bow you can tie for a snug fit. We are the largest Flower girl Designer, Manufacture, and Distributor in the Los Angeles Area. We offer the Highest Quality and Lowest prices Guaranteed!! If you have any questions about this product by ekidsbridal, contact us by completing and submitting the form below. If you are looking for a specif part number, please include it with your message.